George Sabin Cutaş (born on 23 February 1968, in Bacău), is a Romanian politician. He is a Member of the European Parliament (2009-present), elected on the common list of the Romanian Social-democrat Party and the Romanian Conservative Party, and is part of the European Parliament's Socialists and Democrats Group. He is a full member of the Committee on Economic and Monetary Affairs and a substitute member of the Committee on International Trade. He is also a member of the Delegation for relations with the Korean Peninsula, the Delegation for relations with Iran, and the Cariforum-EU Parliamentary Committee. Sabin Cutaş has a degree in engineering from the Faculty of Aircraft Design of the Polytechnic Institute in Bucharest (1992). He graduated from the Canadian Master of Business Administration of the Bucharest Academy of Economic Studies (1999). He followed several other postgraduate courses, including a Business management course organized by AOTS-Sony in Amsterdam (1994) and a course on security and good governance from the Romanian National Defense College (2008). He is a Doctor in Management; title awarded by the Romanian Academy of Economic Studies (2011). Sabin Cutaş has worked for several years in the Romanian media industry. He started as an Adviser to the Chairman of Grivco Group (1995-1999), and later became Adviser on Development Issues for Antena 1, a local TV Channel (1997-1999). He was subsequently a Member of the Management Board of AIBB-Grivco (1997-2004), Executive Director of Antena 1 (2004) and Director General of CCA Intact Media Group (2003-2004). Sabin Cutaş is a Member of the Political Bureau of the Romanian Conservative Party since 2004. From 2004 to 2008 he was a Senator in the Romanian Senate, where he took on the roles of Vice-President of the Romanian Senate (2005-2006), Deputy Leader of the Conservative Party's Parliamentary Group (2006-2007), Vice-President of the Committee on the Economy, Industry and Services (2007-2008) and Leader of the Conservative Party's Parliamentary Group (2007-2008). In 2009, Cutaş was elected Member of the European Parliament on the list of the alliance formed by the Romanian Social-democrat Party and the Romanian Conservative Party. As a member of the European Parliament's Socialists and Democrats Group, Sabin Cutaş seeks to defend the rights of European citizens. The Group to which he belongs is proposing an alternative way of dealing with the economic and financial crisis: a way that seeks to sanction the banking system and fight fiscal evasion, without asking ordinary citizens to pay for a crisis they did not cause. He is a member of the Committee on Economic and Monetary Affairs, where some of the most difficult legislative dossiers are debated, such as the package of six proposals dealing with the financial system that was voted in the summer of 2011 ("six pack"), or that referring to the Financial Transaction Tax. Important non-legislative proposals are also discussed, including the Green Paper on Pensions, a sensitive subject on national governments' agendas. Sabin Cutas, co-rapporteur for the Green Paper on Pensions, published by the European Commission in 2010, launched a proposal of a minimum European-wide pension, with the aim, amongst others, of avoiding demagogic decreases and increases of Romanian pensioners' pensions a few months before elections, only to for them to be sacrificed again where their vote is no longer needed. The Member of the European Parliament is advocating for a way out of the crisis build on investment and solid economic growth that creates employment. He was European Parliament rapporteur for the European Investment Bank (EIB) Annual Report for 2009, through which he asked the Bank to increase its investments in key areas, such as infrastructure, development and research, notably through the fast launch of "Project Bonds", an innovative financial instrument. He also asked the EIB to provide technical assistance to the regions and member states that encounter difficulties in the absorption of funds. He is also a defender of children's rights. As rapporteur for the Protocol for the establishment of a partnership between EU and Uzbekistan in the textile industry, he decided to temporarily suspend cotton imports coming from Uzbekistan, after several NGOs accused the country of using forced child labor on its cotton fields. 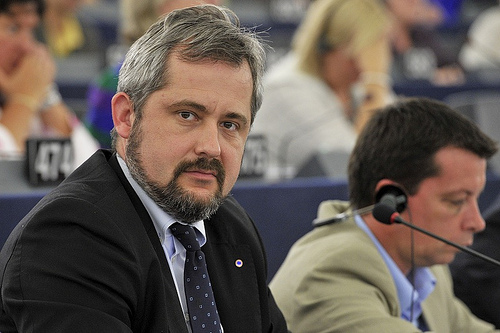 The European Parliament followed Cutas' position with a large majority, approving his proposal with 603 votes in favor. Discussions on the subject will be re-opened once Uzbekistan permits the access of an International Labor Organization Mission on its territory, to monitor the situation on the ground. He also took a stand in the European Parliament in what concerns the pressures exerted at the European level on the Romanian State to force it to liberalize its current adoption legislation. George Cutas fought for the right of Romanian children to be adopted by people that have the same citizenship, bringing to light the risks involved in the liberalization of international adoptions. He co-authored a written declaration asking for the elaboration of a European strategy for the protection of the rights of children suffering from Down's syndrome, as well as for the greater social inclusion of these children, by means of European and national sensitization campaigns. The written declaration became an official position of the European Parliament after it was signed by 386 of its members. Sabin Cutas is also European Parliament rapporteur for the Agreement between the European Union and the Kingdom of Morocco establishing a Dispute Settlement Mechanism, and for the Decision authorizing Member States to accede to the Convention relating to international exhibitions. He was nominated shadow rapporteur for dossiers such as: the Extension of the activities of the EBRD to the South and Eastern Mediterranean, the Accession of the EU to the International Cotton Convention, the EIB Annual Report for 2010, several thematic dossiers related to the recent accession of Russia to the WTO, the Conferment of Macro-financial Assistance to Bosnia-Herzegovina and Serbia, as well as Commercial Aspects of the Eastern Partnership.